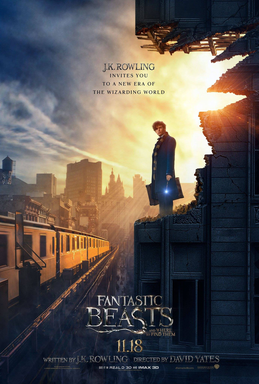 Fantastic Beasts and Where to Find Them, or simply Fantastic Beasts, is a forthcming 2016 British fantasy drama film written by J. K. Rowling as her screenwriting debut and inspired by Rowling’s book of the same name. A spin-off/prequel of the Harry Potter film series and directed by David Yates, the film will be the first installment of a trilogy. Rowling is also producing the film alongside David Heyman, Steve Kloves, and Lionel Wigram. The film stars Eddie Redmayne, Katherine Waterston, Dan Fogler, Alison Sudol, and Colin Farrell. Fantastic Beasts and Where to Find Them is scheduled to be released on 18 November 2016 worldwide. Check out the new Comic Con trailer of the film.